When floor space is limited, the Whitney Brothers 24-Cubby Tower provides plenty of storage within a small footprint. Made of high-quality birch laminate and featuring a tip-resistant design, the tower is a vertical, visible storage solution for classrooms and studios. 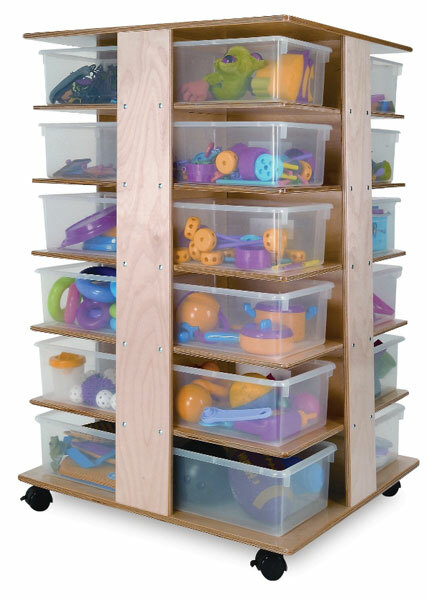 The 24-Cubby Tower includes 24 clear bins to store art supplies, books, toys, and more. It holds 24 clear plastic trays that measure 5½"H × 10½"W × 13"D (14 cm × 27 cm × 33 cm). The tower sits on four heavy-duty casters that allow it to be moved easily. Special care is given to ensure all edges and parts are smooth, rounded, and firmly attached for safety to keep them from breaking free or cracking from rigorous use. The 24-Cubby Tower measures 41"H × 28½"W × 24"D (104 cm × 72 cm × 61 cm). It weighs 116 lb (53 kg). Made in the USA. The Whitney Brothers 24-Cubby Tower includes a lifetime warranty. ® Whitney Brothers is a registered trademark. Every Whitney Brothers product carries the prestigious Greenguard Indoor Air Quality Certification™ and the more stringent Greenguard Children & SchoolsSM certification. Every Whitney Brothers product also carries a lifetime warranty.